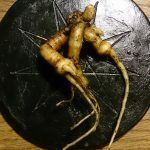 Returning from 3 weeks of garden work, Teufelskunst is resuming business with a new offer of five Mandragora officinarum roots. The roots you see above will be available for purchase this week. They have shed their leaves and are currently withdrawn to the ground, which gave me the opportunity to study and replant them. Now is also a good time to sell and ship them safely. 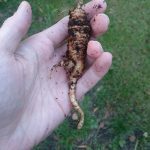 The roots are between 12-10 cm in length and weigh between 31-37 gram. Their shapes inspire me to name and make art for them. The offer presented here is again for the live root and a detailed ink study of the same. Note: for convenience root and art are shipped separately this time. As I am typing this, the candle has already extinguished and there are nearly as many tiny air bubbles in the glass of water as dots on the ink drawing in the background. My little fall equinox altar is made of tokens gathered during the past days. It also features a small glass of self-made hawthorn liqueur. The hawthorn goddess was addressed for empowerment at a time when I am down with flu and need to recharge both physically as well as spiritually. The drawing is one of three drawings I did last week. It is the second in the small series and titled “Pathfinder”, since the shape reminded me of a creature equipped with plenty of sensors, which seems to be pushing forward against an icy storm. 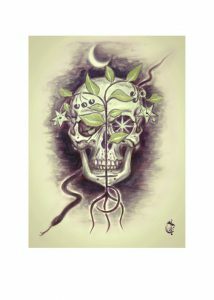 The third drawing is now in the possession of The Witching Veil, together with the autumn mandrake root depicted on it. The incense burnt was the Black sacra from Luban Frankincense Supplier. It has a deeper, somewhat richer aroma than the green and white frankincense from Oman, and fits just perfectly for the season. 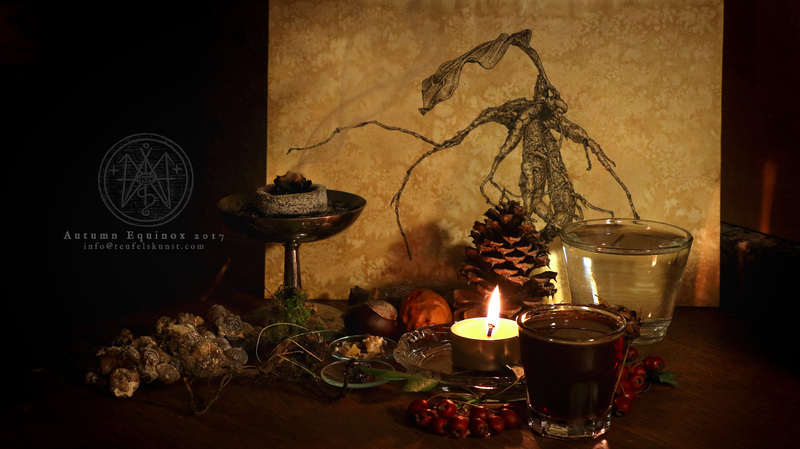 With the passing of the Fall Equinox, Samhain is just around the corner. I will hence begin preparing my presentation for this year’s Samhain Celebration in Gotha, which I am attending for the second time in a row. 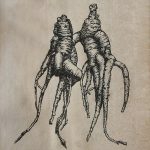 The latest addition to the shop will be new autumn mandrake roots, which will go up for sale in the evening. 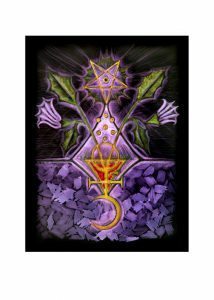 Please also take a look at the new listings in the Sigilla Magica category. Last but not least I thank all of you, who ordered my Dog Days incense. I have but one jar each left. 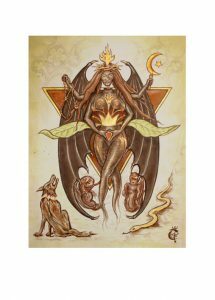 The coming days I will work on new batches of Samhain incense, as well as restocking incense for Qayin and Lilith. 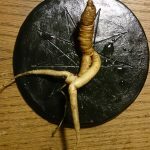 This project began earlier in 2016, when parting with a few homegrown live mandrake roots and sending them to new homes. Part of the deal for the new owner was to commission a portrait of the very root they were to receive. Each root is drawn with ink and quill on stained paper. Attention is paid to the peculiar shape and features of each root. The result are detailed portraits, which are not only unique pieces of fine art but which also give the owner a reference, when the roots are planted back into soil. 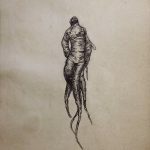 I’m sorry if you have been browsing the Teufelskunst website and found that most of the items listed here are sold out. This is because I have been working mainly on commissions since some months and had little or no time to add new ready-made items. However, there are still some incense blends as well as amulets available and of course the herbal supply continues. The original paintings are done with plant juices and blood. The images are ca. 110 x 150 mm, the paper format is A5. Protected inside simple black carton and envelope. Available are 10 copies of each. Nice price for all three: 13 Euro + shipping! 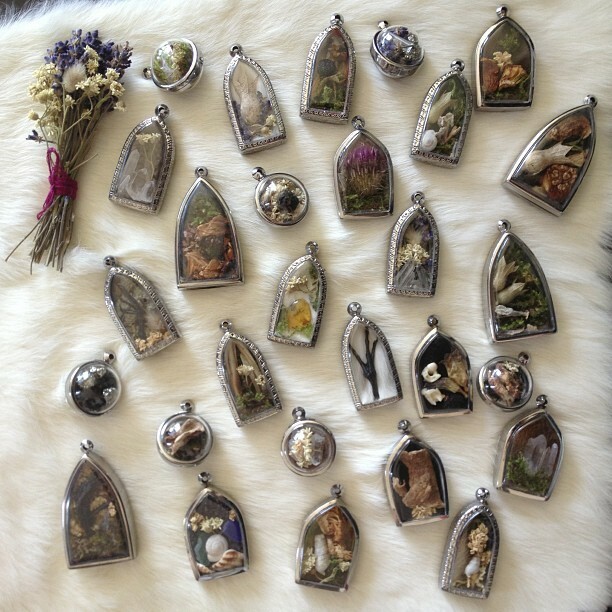 The pendants are filled with dried Mandrake, Henbane, Belladonna, Fly agaric, Sage and more. A special treat are the dried flowers of Henbane and Belladonna, which have been carefully plucked by hand and dried at our altar. From flower to fruit and seed, from root to leaf, the pendants carry versatile links to some of our most powerful plant allies. We received in the mail new precious working and crafting materials, amongst which was a huge gift from an English sorcerer: in the center of the package a Giant Poison Hemlock root, about 40 cm, perfect for a central altar piece in the work with the Typhonian Currents or in Rites of the Dark Goddess in Her Strangler-Aspects and Her Succubi. To the initiated Poison Hemlock is on the other hand also a strong ally in the battle against all archonic suppression. The above roots are availabe for purchase. Prices on demand. 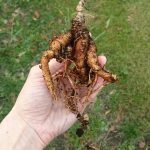 Also available are recently harvested roots of Aconite. 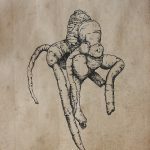 The roots are 7-13 cm in length, straight, curled and some forked, for making talismans or usage in powders and potions. Price varies from 5-15 €, depending on root size and shape. 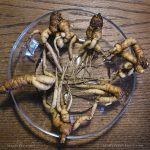 Further fresh Male Fern Root, Mandrake Talismans, Seeds of Poison Hemlock, Mandrake and Poppy and some anorganic ingredients such as Sulfur and Iron Oxide can now also be bought from us. Special Thanks to Cyril Helnwein for the terrific pic!